Financial advice can be delivered in three ways – human, automated and a hybrid model. Traditionally financial advice has been delivered by humans. In the last few years, technology has enabled the delivery of financial advice in an automated way without any human interference. This model is popularly known as robo-advisory. A hybrid model for delivering financial advice leverages both on technology automation and human interface. According to various industry estimates, by 2020, the financial advisory market is estimated to be between $3trn and $5trn. A large portion of these assets are expected to be advised on robo-advisory platforms. In US, Betterment is the largest robo-advisor with around $7bn of assets under advice and 200,000 customers. Considering the large size of the financial advisory market, there is room for many more players in this market. In US, there are nearly 112.6mn people with assets/net worth less than $2.0mn who are under-served by the financial advisory industry. Robo-advise has come as a boon to these masses. It is less intimidating, offers free do-it-yourself features and brings greater transparency in operations. Interestingly, what was started to tap the under-served segments has also caught the attention of the more affluent/wealthy segments of society. Traditionally, asset management firms focused on fund management and were not good at leveraging technology and giving financial advice. Some of the traditional firms are quickly adapting and introducing their own robo-advisory platforms. Advisory firms should primarily focus on goals based financial advice. The purpose of financial advice is to help clients create a safety net, plan for retirement and to build wealth. This can be done by making financial advice accessible, intelligent and aligned with the clients’ requirements. What role does automation play in financial advice? Automation helps clients improve their overall portfolio returns, by reducing the costs of financial advice and improving investment decisions. For example, advice based on behavioral data and analytics helps clients make better decisions related to impact of taxes on their overall portfolios. The advice for financial advisors is to focus less on fund manufacturing, commission-based revenues and third party kickbacks. Rather the focus should be more on personalized investment and transparent pricing. The key focus should be solely on giving advice. What are the implications for traditional financial advisors? Human financial advisors see value in the use of automated advice in helping their clients improve their portfolio returns. Traditional human advisors have begun to partner with robo-advisory firms and are leveraging technology to service their own clients. In a US context, the robo-advisory market is growing fast with a few notable players emerging in the market. 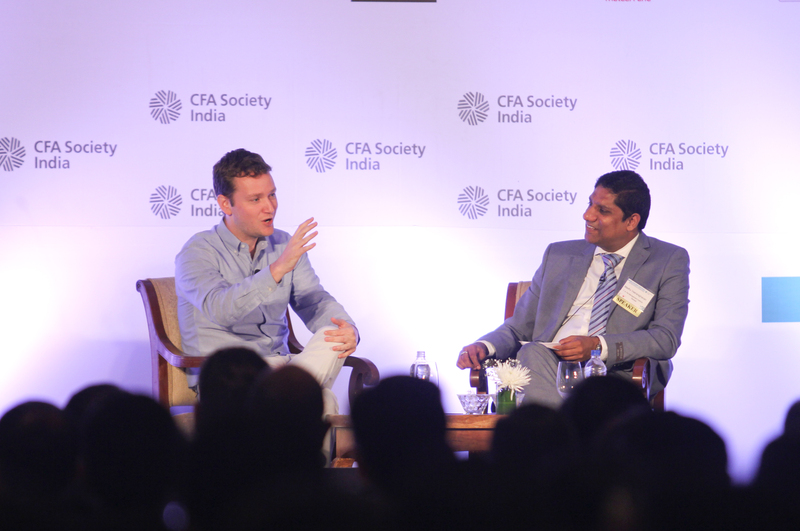 Robo-advisory market in India is still in a very nascent stage. It is expected that it will be several years before notable players emerge in the Indian robo-advisory market. This entry was posted in India Investment Conference, Mumbai and tagged #IndiaInvConf, Angaros Group, CFA Institute, CFA Society India, IIC17, Indian Association of Investment Professionals, Jon Stein CFA, Jonathan B Stein CFA, Madhu Veeraraghavan, Manish Jain CFA, T.A. Pai Chair Professor of Finance, TAPMI. Bookmark the permalink.